You cannot hear the people sing in Andrew Davies’ adaptation of Victor Hugo’s classic novel Les Misérables, and that is just fine. The six-episode series, which aired on the BBC last year and is now premiering as part of PBS’ Masterpiece slate in the United States, is in turn a sumptuous and horrifying exploration of the lives of the French working class and poor that spans the decades of early the 1800s (notably between revolutions). If the title doesn’t tip you off, an opening scene of the corpses of horses and men strewn across the battlefield of Waterloo will. But even if you haven’t read the work or seen the play (and its own adaptations), Hugo’s accessible and timeless story remains anything but miserable, as it embraces the struggle to find your way and keep your head above water when everything around you seems to want to drag you into the abyss. Airing on Sunday nights for the exact length of time as Game of Thrones, Les Misérables provides an alternative point of view to fantasy and the machinations of kings. Its large, sprawling cast revolves around the suffering, ultimately heroic figure of Jean Valjean (Dominic West), who was imprisoned for 20 years for stealing a loaf of bread. Valjean is not a noble man at the start, continuing to steal even as soon as he’s let out on parole. West growls his way through his lines here, as Valjean is coarse, suspicious, and ungrateful, but a bishop sets him on a new path towards redemption that is never anything other than hard-fought. Throughout Les Misérables, Valjean spins in and out of the orbits of a host of classic characters, like the naive young Fantine (Lily Collins), her daughter Cosette (played as an adult by Ellie Bamber), the villainous thief Thénardier (Adeel Akhtar) and his nasty wife (Olivia Colman), as well as the obsessive police inspector Javert (David Oyelowo) and a young aristocrat with a love of the republic and romance, Marius (Josh O’Connor). 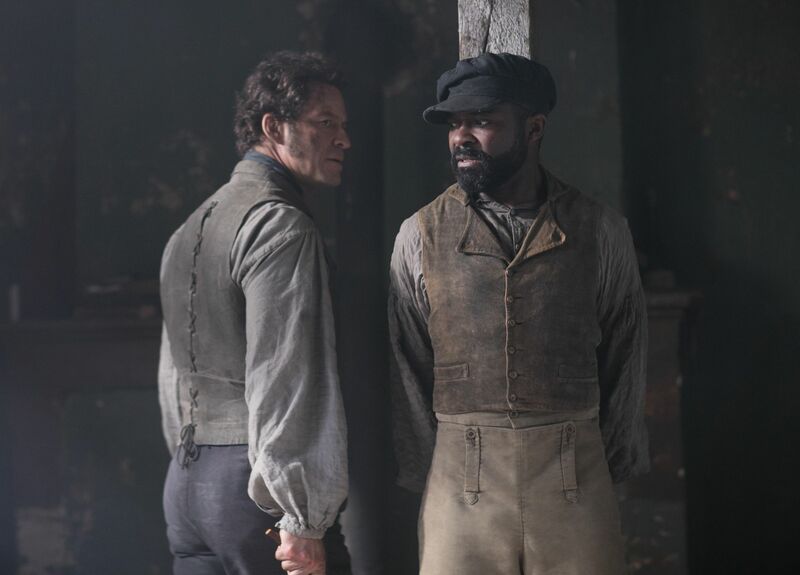 The miniseries is absolutely stacked with wonderful performances, particularly from the dueling West and Oyelowo, although everyone really deserves a mention — seeing Akhtar and Colman play off of each other in these lightly comedic roles is a joy. Collins, too, turns in a devastating performance that fully breaks your heart (and will make your teeth hurt). Six hours is just enough time to delve more deeply into the story than previous movies or musicals have done, but not quite enough time for all that Hugo packed into his 1,500 page novel. As such, Les Misérables does an admirable job of hitting the high notes of the drama in ways that are continuously intense, emotional, engrossing, and suspenseful. Davies has also allowed just enough lightness and humor in so that the world never becomes oppressively dark, and however improbably it is that they might continue to cross paths with one another in various ways, those moments always manage provoke an excited gasp — be it of delight or horror. There is an intense empathy that develops around these characters whose desperation is always keenly felt. They have struggled and suffered loss, yet all leave behind something better than what they started with. There are big themes here that Hugo wanted to convey about life, liberty, and égalité, as well as loyalty, brotherhood, and the possibility of redemption, and Davies balances it with pointed conversations that blend seamlessly in among the personal drama. Tom Shankland’s direction over the course of these six episodes also lends a strong visual narrative to the series. Villains are often lit and shot from below, sneering, their greedy eyes sunken. There are cold, visceral depictions of sickness and death, which stand in stark contrast to wonderfully warm and joyous moments of romance. The adaptation is also fantastically racially inclusive with its casting, handing over key roles to people of color and populating Paris with diverse crowds. And speaking of Parisian crowds, an extended sequence of a group of revolutionaries holding a barricade against the soldiers’ advance is filmed on a small scale and in cramped quarters for the better part of an entire episode. It’s a nightmarish sequence that is frightening, quietly triumphant, and deeply sad. Masterpiece’s presentation of Les Misérables premieres Sunday, April 14th on PBS.